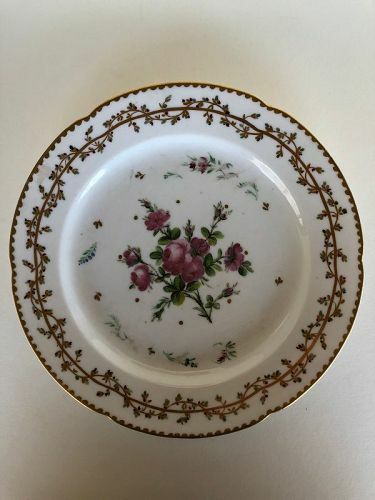 A porcelain dinner plate decorated with a gilt rim, a gilt rope with flowers on the lip and floral sprays in the well. 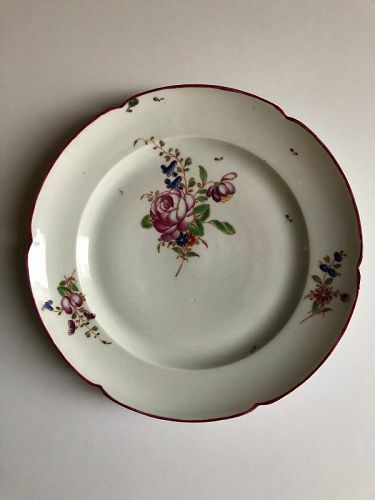 Marked in overglaze red enamel on the back “B/Potter/1” The mark is probably from around 1794 for the short lived partnership of Potter and Blancheron. 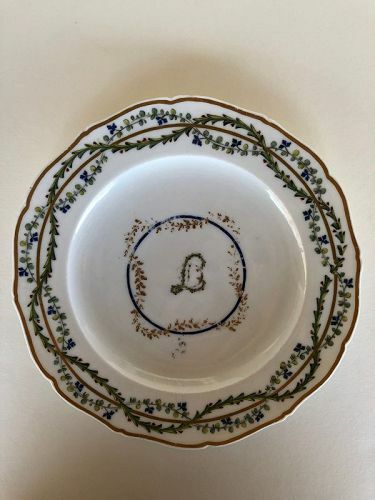 A lobed dinner plate with a gilt rim, a gilt circle entwined with floral ropes on the lip and a worn monogram enclosed by a blue circle wrapped with a gilt wreath in the well. Diameter 9 1/8 inches (23 cm). 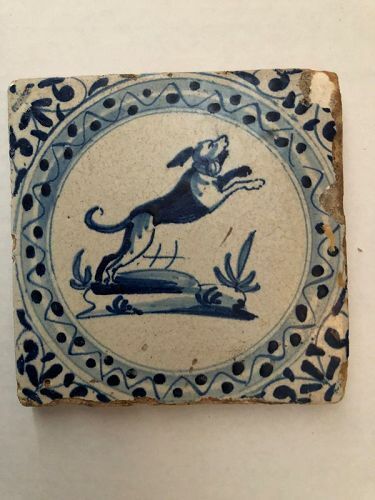 Marked in underglaze blue on the back with the Seguin factory mark. The factory was active in Vincennes from roughly 1779 to 1788. Condition: Enough wear to the enamel painting in the well to be distracting. There are internal and rim hairlines. 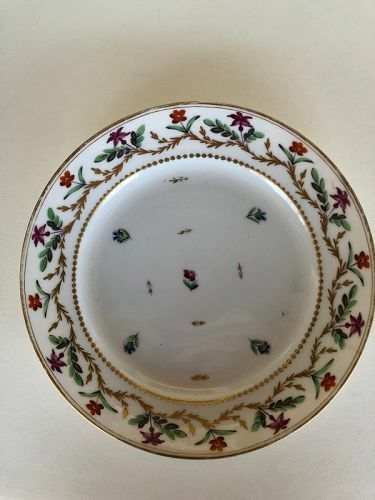 A nicely decorated lobed dinner plate with an off center bouquet of bright flowers in the well of the plate, two sprays of flowers on the lip and a reddish-purple rim. A little green bud near the rim covers a firing flaw. Diameter 9 7/8 inches (25 cm). 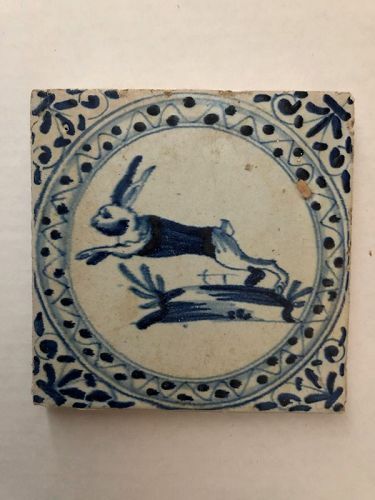 Underglaze blue mark of crowned interlaced Cs. Condition; very good and little wear. A short hairline crack from the rim goes about an inch into the plate. Bright colors and interesting that no gilding was used. 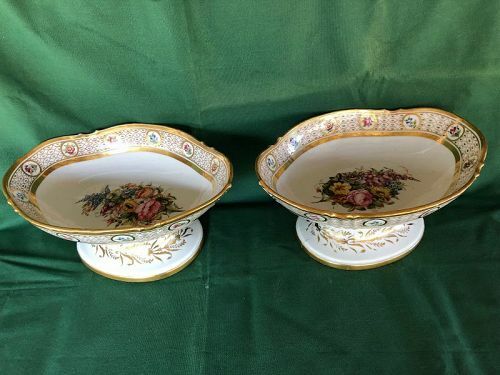 A Pair of lobed dinner plates 9 3/8 inches (23.8 cm) diameter with a dentil gilt edge and overall sprig decoration. The cornflower sprigs are primarily blue and green with a touch of red. 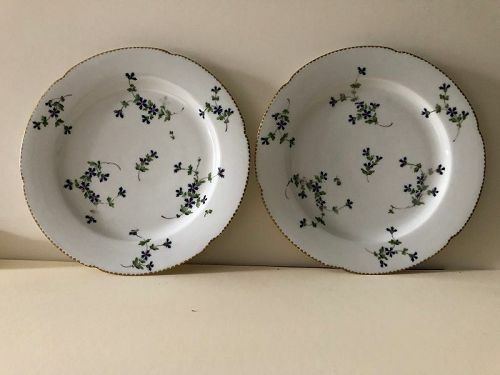 Both plates have the crossed torches in underglaze blue. The factory, Locre, Russinger, Pouyat is called Locre or sometime La Courtille. It was active from 1773-1824. 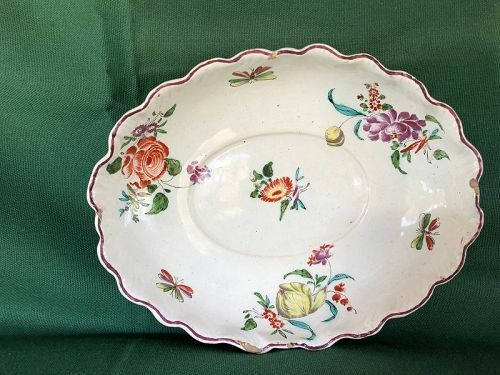 Oval faience fluted dish with flowers circa 1740, Strasburg? 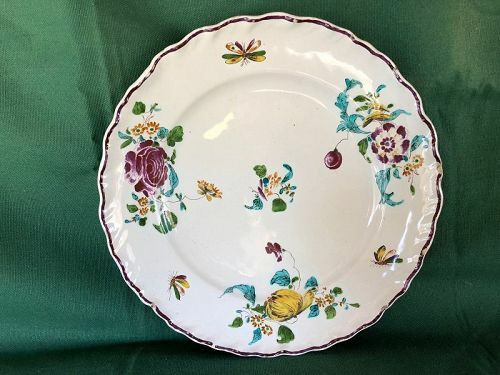 French faience dinner plate with flowers circa 1740, Strasburg? 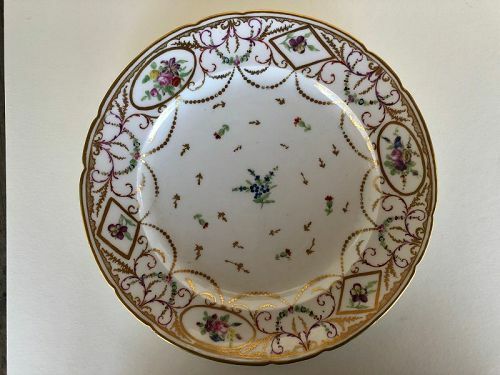 A faience dinner with a shaped edge decorated with flowers, insects and a manganese rim. Painted on the back, “No: 4.” The mark and the decoration are typical of Strasburg circa 1740. 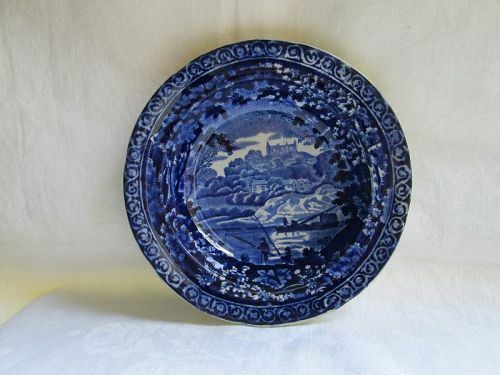 The plate has no foot and pontil marks from firing. It is 9 ½ inches (24 cm) diameter. Condition; Generally good with light wear. Small chips on the rim. Pair Chinese blanc-de-chine porcelain pigeons. 19th century. 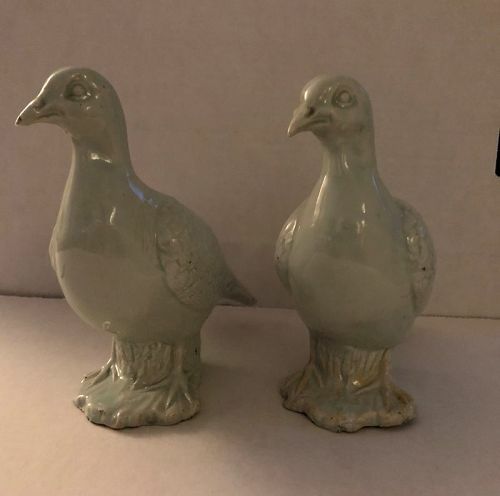 A pair of very detailed molded porcelain figures of standing pigeons. The glaze is slightly blue/green. On close examination it is clear that though they were made from the same mold, the details of the lines in the feathers, breasts and the bases were done by hand. A slight tint of orange shows through thin spots in the glaze on the bases. They are an identical pair rather than an opposing pair. Height 6 7/8 Inches (17.5 cm), length 6 5/8 inches (17 cm), width 3 inches (7.5 cm). 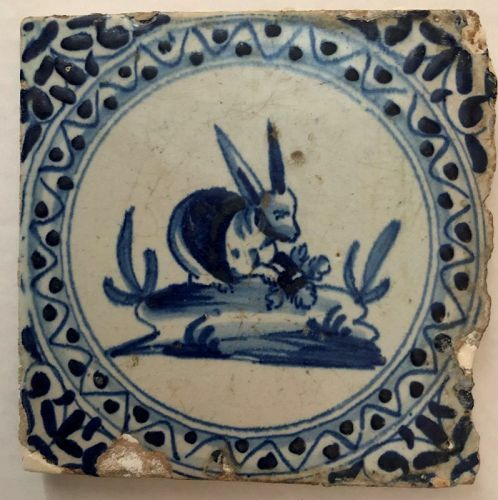 A set of twelve Dutch delft wall tiles of a hand painted blue basket of fruit inside a square with a white square behind it at 45 degrees with the same orientation as the tile with its manganese ground. A fourth of a blue flower with a touch of manganese is painted in each corner. Each tile is approximately 5 3/16 inches (13.5 cm) square. Though the theme remains the same each tile has some different details, e.g. one has a bug over the basket. 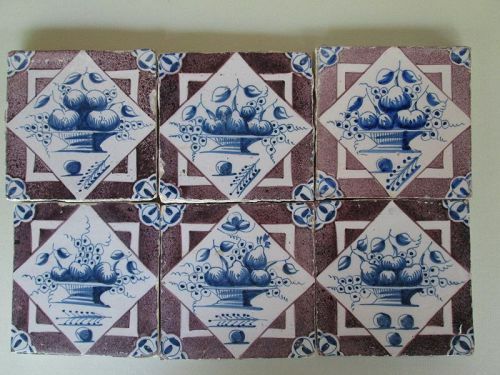 A set of six Dutch delft wall tiles of a hand painted blue basket of fruit inside a square with a white square behind it at 45 degrees with the same orientation as the tile with its manganese ground. A fourth of a blue flower with a touch of manganese is painted in each corner. 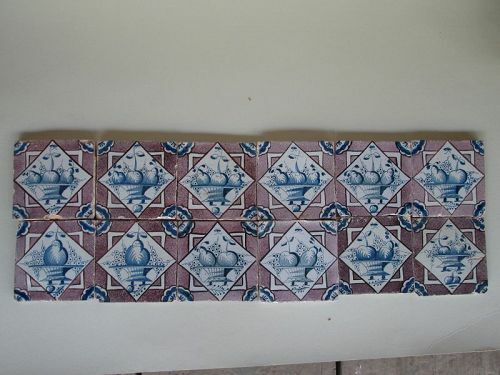 Each tile is approximately 5 3/16 inches (13.5 cm) square. 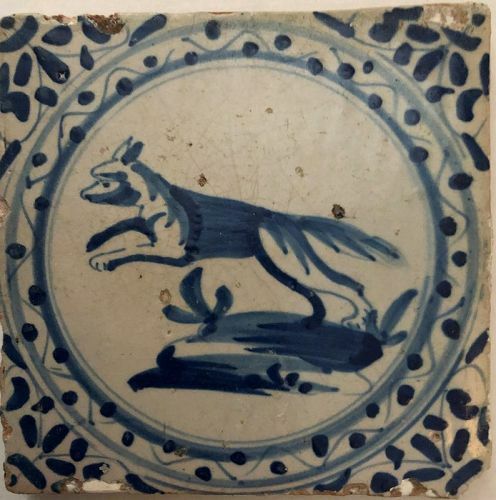 Though the theme remains the same each tile has some different details, e.g. one has a bug over the basket. A common form of pitcher made by the Tucker factory in Philadelphia around 1830. 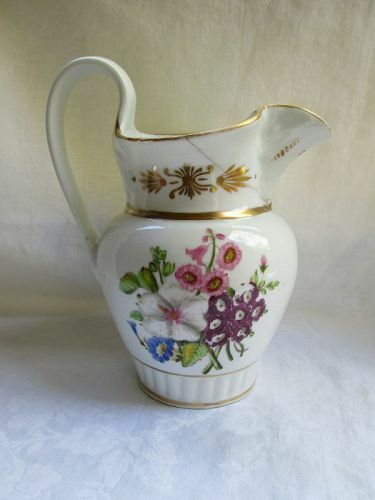 It is unmarked as is often true for Tucker, but the form is theirs, the decoration typical of their floral work and the gilding similar to other Tuccker pitchers. 9 3/8 inches (24 cm) tall.